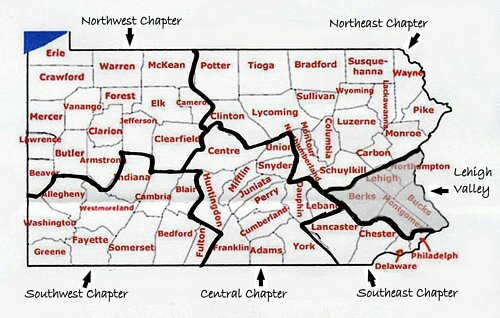 The above PA map shows a rough outline of which counties are included within the Lehigh Valley Society (highlighted in grey). Light dinner of Sandwiches and Salads will be available for a donation. In lieu of a speaker, we will be permitted to enjoy the current art exhibit in the gallery. During the course of our regular business meeting, there will be some discussion regarding the "PAA Challenge" (membership drive) which is planned for the April meeting. Bring your ideas and suggestions! Please RSVP to Joe Sheehan by Sunday March 3rd, 2019, at paa.lv.chaptr@gmail.com or (484)224-6334.